On the November 1st, 2003 a baby boy was born – a small brindle bundle later to be named Clash Nitro. Destined to become famous not because of his prowess on the track but posthumously along with Rent A Flyer, whose deaths exposed the cruel and callous side of greyhound racing. Clash Nitro left the shores of Ireland in early December 2005, to race in the North East of England, leaving his three brothers and four sisters behind. Clash Nitro’s racing career lasted less than seven months, during which he sustained numerous injuries restricting his earning capacity to just nine races. Having suffered an injury in April 2006, his owners, rather than affording him the professional advice of a vet, saw fit to seek the help of a ‘dog physiotherapist’ who suggested nothing more than ‘rest’. His first race following his injury was on July 8th. For some months Clash Nitro had taken up valuable kennel space and was given this one last opportunity, to ‘bring home the rent’. Without specialist veterinary care and still suffering the effects of his previous injury, the race was one too many for Clash Nitro and despite his eagerness to please his owners, he sealed his own fate by finishing 5th. The decision to ‘evict’ Clash Nitro, was a forgone conclusion, in view of the fact there were ‘plenty more where he came from’. Rent A Flyer was another such greyhound born on May 11th 2004. A black boy born also from a litter of eight having two brothers and five sisters. Although Rent A Flyer only raced on ten occasions, he can be considered fortunate when compared to two of his sisters, Jodys Jet and Raffas Dream, both of them never managing to make the grade and raced only once during their short lives in Ireland, never to be seen or heard of again. Torn from his native Ireland and siblings before his second birthday, Rent A Flyer, disappointed his owners during his trial performances and as with Clash Nitro, the “dog physiotherapist” suggested a period of kennel confinement and rest. Failing to make the grade and earn his keep, he, like Clash Nitro, had become a financial liability and in the cut-throat business of greyhound racing, there is no room for compassion or sentiment and the short trip to Seaham for cheap slaughter was inevitable. Neither of these greyhounds were rewarded the humane services of a professional vet or deemed worthy of being acknowledged as a statistic, dead or alive. On Wednesday 12 July 2006 Clash Nitro aged 2 years and 9 months and Rent A Flyer, even younger at 2 years and 2 months were taken to Seaham. Unaware of their fate they showed no resistance when lead to the slaughtering shed, Rent A Flyer only glancing back when alerted by the camera shutter of the undercover photographer. We will never know who had to watch his kennel mate being slaughtered and then endure the fear of knowing this was also to be his impending death. We will never know if Smith had executed his ‘Captive Bolt Pistol’ effectively, designed only to stun and not kill outright. We will never know the names of the estimated 10,000 greyhounds David Smith buried on his land, or how many of those were buried alive in the burning lime. We do know, however, there were 12,819 greyhounds just like Clash Nitro and Rent A Flyer exported from Ireland last year (2007), all trained to perform and tragically just waiting, unbeknown to them, to be raced to death for the price of a bet. Greyt Exploitations needs your financial support to further develop the database and evidence the cruelty of greyhound racing. Please help us achieve this. If you would like to be included on our mailing list and be alerted to current 'News' or if you have any questions/information for us, please feel free to either email the address below or contact us by phone in strict confidence. Alternatively, you can use the contact form provided here. 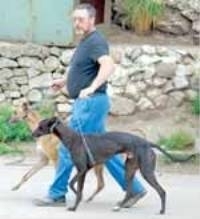 If you know of greyhounds suffering or being abused - please let us know. All information will be treated in the strictest confidence. You can find us on Facebook, Twitter and Youtube. If you would like to be included on our mailing list and be alerted to current 'News' or if you have any questions/information for us, please feel free to either email the address below or contact us by phone in strict confidence.